Did you know that lemon juice has benefits for acne and scars? It’s a terrific alternative to the harsh chemicals often used when treating both. Acne is the most common skin problem faced by teenagers and adults alike, and no matter the age everyone wants to find a way to eliminate the acne and scars quickly and effectively. The pores on our faces can often get clogged with oil, dirt, and dead skin cells, which is the main reason for acne whether it is a whitehead, blackhead, pimple, or cyst. Typical acne treatments have either (and sometimes both) salicylic acid or benzoyl peroxide in their treatment formulas, but they can dry out the skin and cause redness and irritation. Lemon juice is natural, costs pennies per treatment, and can fight the inflammation that often makes acne red and irritated. Lemons are amazing for treating acne on chest, face and removing scars, thanks to their natural and nutritional properties—they aren’t just for making lemonade! High in vitamin C, lemon juice helps develop collagen, a structural protein found in the body, and this collagen is what creates new skin cells and fresh skin. The acidity in the juice helps kill bacteria sitting on the skin and in pores, and breaks down the sebum (oil) contributing to the clogged pore and therefore the acne. The acid also helps control the creation of sebum by the pores; less sebum production means fewer clogged pores and pimples, whiteheads, and blackheads. 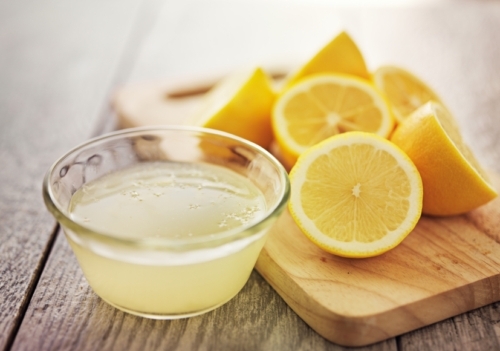 Lemon juice even works well on cystic acne, which is much more troublesome to treat. When applied topically, it dries out and shrinks the red bump. Lemon juice also contains alpha hydroxy acid (AHA), which contributes to its exfoliating properties. Exfoliating dead skin cells allows new cells to take their place, allowing for smoother, clearer skin. Another benefit to using lemon juice to treating acne and scars is that it lightens whatever it touches, like hair and even skin. Some scars leave red, brown, or slightly pink spots, and when regularly treated with lemon juice they will lighten and fade. It won’t take long before results are apparent. According to the American Academy of Dermatology, acne affects 40 to 50 million people in the United States, and is something most people have experienced at least once in their lifetime. Some suffer from it chronically, while others only get it periodically and then never again. Below are a number of ways to use lemon juice to treat acne, and all involve some kind of wash or application, so make sure you have a good half-dozen lemons on hand. Cut up a lemon and squeeze all the juice from it into a small bowl. Have a few cotton pads on hand. Wash your face with a good quality cleanser and rinse; this should be done twice a day to keep oil levels to a minimum and prevent further clogging of pores. Pat your face dry with a clean towel. An extra step that is beneficial to do after cleansing but before the lemon treatment is to drape a hot wet washcloth on your face (be sure to cover the entire face) and leave it on until it is no longer warm. The heat from the cloth will open up your pores, which will help remove excess sebum and trapped dirt, and will allow the lemon juice to penetrate the skin’s layers and cells more deeply. The next step is to dip the cotton pad into the undiluted lemon juice and then dab it onto the acne—don’t apply it everywhere because it could irritate sensitive skin that isn’t bothered with acne. Leave it on for 10 minutes, but if it burns, stings, or is feeling irritated, rinse it off; but try to leave it on for as long as you can handle it, because the longer it stays on the better results you’ll see. Apply a moisturizer (one that is noncomedogenic, i.e., won’t cause acne) and avoid going out into the sun for a few hours; lemon juice can make the skin more sensitive to ultraviolet rays. A mask is a wonderful way to reap benefits from the nourishing properties of its ingredients, and this tried-and-true recipe has been used for centuries. Not only will it help fight acne, but it will leave your skin smooth and soft because of the milk and honey. In a bowl, combine the lemon juice, honey, and milk in proportions that follow a 1:2:3 ratio. Mix until a paste forms; you don’t want it dripping all over you. Once combined, apply to a thoroughly washed face and leave on for 30 minutes, after which rinse with warm water and pat dry. Benefits will be apparent after four to five treatments. This is gentle enough that it can be done every day if desired. Though the benefits of lemon juice for acne treatment are well documented, unfortunately there are some people who can’t and shouldn’t use lemon juice for acne and scars. People with dark skin should avoid using lemon juice topically on their skin. Melanin is a substance responsible for skin and hair color; when lemon juice is applied on darker skin, it can trigger the production of more melanin, resulting in dark spots. Before trying lemon juice on dark skin, it’s best to speak to a dermatologist to determine if it’s the best course of treatment for your acne. Lemon juice is a wonderful natural treatment for acne and scars because of its antibacterial and regenerative properties; the turnover of cells gives the skin a fresh appearance. Whether used as a wash with water, a mask, or a topical spot treatment, lemon juice has healing properties that reduce the appearance of red, irritated acne spots and can often heal them to the point of elimination. It’s a natural and fresh solution worth exploring, and as a bonus, it’s entirely cost-effective! “Lemon Juice for Acne and Acne Scars,” Dermatology web site; http://www.dermatology.ca/skin-hair-nails/skin/acne/#!/skin-hair-nails/skin/acne/what-is-acne-2/, last accessed February 23, 2016.
http://noskinproblems.com/lemon-juice-for-acne-and-acne-scars/, last accessed February 23, 2016.
http://homeremediesforlife.com/lemon-for-acne-scars/, last accessed February 23, 2016.
http://www.facingacne.com/lemon-juice-cure-reduce-acne/, last accessed February 23, 2016. “How to Clear Acne with Lemon Juice,” Livestrong web site; http://www.livestrong.com/article/253690-how-to-clear-acne-with-lemon-juice/, last accessed February 23, 2016.
http://www.med-health.net/Lemon-Juice-For-Acne.html, last accessed February 23, 2016. “Acne,” American Academy of Dermatology web site; https://www.aad.org/public/diseases/acne-and-rosacea/acne, last accessed February 23, 2016.